FILE - Michael Jackson at a press conference at London's O2 Arena, March 5, 2009. Michael Jackson's career begin in the mid-1960s before his 10th birthday. As the youngest member of the Jackson 5 and later as a solo artist, Jackson became a global icon. His music has sold more than 400 million albums, earning 13 Grammy awards and spinning dance moves that captivated the world. Authors, too, have been captivated by the man. Since his death in 2009 at the age of 50, there has been a seemingly endless stream of books written about him. MJ: The Genius of Michael Jackson is one of the latest, but not likely the last. Author Steve Knopper spent three years interviewing more than 400 people who knew Michael Jackson — from relatives and friends to key record executives and celebrities. His goal was to explore what he calls the genius of the King of Pop. "He was a genius on many levels," Knopper said. "The three key ones to me were his intuitive singing style, the way he put in those rhythms. Secondly, the way he innovated dance at the time where there wasn't a lot of dance in the pop culture. Then, thirdly, his songwriting. And I think he doesn't get enough credit for being a great song writer." The ability to learn from others and absorb various experiences is seen as one of the factors that fueled Jackson’s success. In the late 1970s, he started collaborating with legendary record producer Quincy Jones. 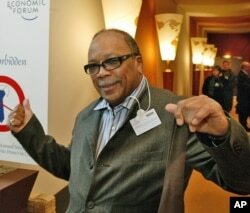 FILE - Quincy Jones in 2004. "It was actually Quincy bringing a whole team to the studio, and sometimes they would work on Michael's songs together," Knopper said. "On other times, he would bring in a prominent songwriter like Rod Temperton who wrote 'Thriller' and a lot of other great Michael songs." "Thriller" — released in 1982 — propelled Jackson across pop music's racial barriers. "Disco, which had been huge for three, four years, had just crashed," Knopper said. "When Michael came along with 'Thriller,’ radio stations and MTV and other entities within the music business were segregated. There were black artists who were on urban radio stations and white artists were on either Rock or Top 40 or other radio stations. So, Quincy and Michael and their teams specifically decided they wanted to make music that was for everybody." "It was a way for Michael as an African-American artist to get onto white radio stations, if you will, using Paul McCartney," Knopper said. "Once they were able to make that move, all the rest of the songs followed. Later, of course, to get on white Rock stations they employed Eddie Van Halen ... to do the solo that enabled them to cross over as well." One of Jackson's trademarks was his moonwalk dance, the famous glide that looks like he's moving forward and backward at the same time. "They had actually done the dance to one of Michael's songs, 'Working Day and Night'," Knopper recalled. "He eventually invited a couple of these guys to teach it to him. I did an interview with Cooley Jackson who explains that Michael kept saying, ‘I'm not getting it. I'm not getting it.' It's a very difficult move to get and it didn't click till you worked on it and worked on it, and finally Michael got it." Jackson also showed that persistence in making sure the words and music clicked. Some of his best songs were years in the making, like "Earth Song" from the 1995 “History” album. "Michael was a great balladeer, but 'Earth Song' was his best, most complex ballad and he used it in different ways," Knopper said. "He used it to sort of talk about saving the environment, saving the children and it was a very adaptable anthem. He really labored over this anthem. It started as collaboration with one of his many songwriters and producers, Bill Bottrell, during the ‘Dangerous’ album in the early 1990s. Michael kept tinkering with it over a period of seven or eight years and finally turned it into this bold anthem." While open to influences and inspirations, Jackson had his own style. Knopper says that explains his fashion sense, too. 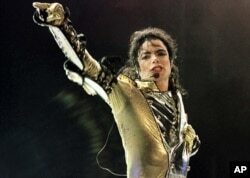 FILE - In this Aug. 25, 1993 file photo, American pop star Michael Jackson performs during his "Dangerous" tour in Bangkok. "Certainly, the military jacket that he wore for much of his career, he got that from an old video by the New Wave British singer Adam Ant," he said. "The iconic stuff he wore for the moonwalk dance — the famous black jacket — he borrowed it from his mother. The black shoes and white socks that he wore on stage for many years, that was a Fred Astaire trick. He always wore white socks with high pants so people can see your feet if you're on a dark surface." 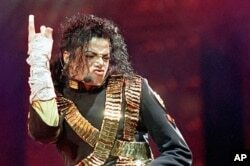 Jackson's genius in so many arenas is what made him a global cultural phenomenon, whose impact on pop music will be felt for generations to come, Knopper said.